Bravo! Homestyle Complete Dinners feature raw, freeze-dried meat or poultry as the #1 ingredient, plus veggies and cranberries. They are natural dinners with added vitamins and minerals. 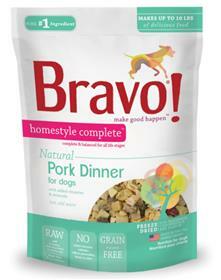 Just add water and stir to make a healthy, highly nourishing meal your dog will love! No grains or gluten: a great option for dogs of all ages, especially those prone to food allergies or sensitivities. Ingredients: Pork, Sweet Potatoes, Pork Liver, Chickpeas, Pork Hearts, Green Beans, Dried Eggs, Cranberries, Tricalcium Phosphate, Choline Chloride, Dried Kelp, Tumeric, Salt, Mixed Tocopherols, (Proteinated Minerals and Vitamins), Rosemary Extract.